I did not get a lot accomplished- I need to work more on my ride plans so I don’t fritter my nights away. I worked with Selena, walking around the property and grazing her. JR and Wizard also got some grooming, walking, and grazing. 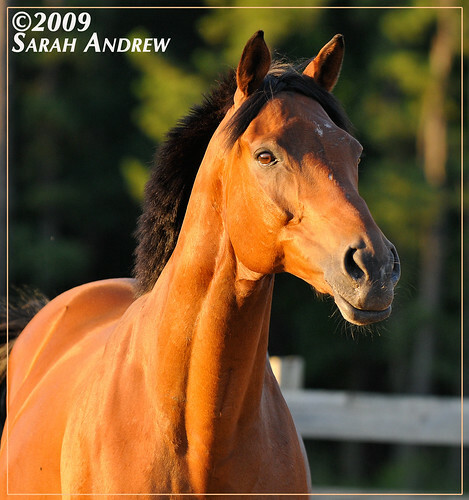 Wizard: I gave Wizard a little time in the indoor arena to trot at liberty so I could watch his movement. He’s definitely improving. My plan is to do lots of hand walking in the next few weeks. While he was turned out in the arena, he was arching his neck and doing his best to show off for his audience (me and my mom). He’s not quite the ham that Alibar was, but he did get a big laugh out of us when he sniffed the end of a hollow jump pole- the sound reminded me of the big horn used in the Ricola commercials. Selena: My dressage saddle appears to fit her pretty well. I took her into the indoor arena and asked her to longe for just a few rotations, about five minutes. She broke from a trot to a canter several times. She’s out of shape so I did not want her exerting herself so I mounted up and rode her at a walk for a few minutes. She was good as gold. She shook her head a few times while I was hand walking her. Bugs? Teeth? Not fond of the bit? I’m not sure, but she did not do it under saddle. A late night ride :^) I got to the barn around 9pm for a quiet, focused ride with Selena. I tacked her up, did about 5 minutes of hand walking to get her warmed up, and mounted up. She was fantastic again. We walked for about 15 minutes, stepping over a few ground poles and riding in large, easy patterns. She is a well-trained horse so my biggest task is getting her fit without moving too quickly. My plan is to start doing trot sets- walk the short side, trot the long side, etc. JR got a few minutes turned out in the arena to stretch his legs. Wizard got 15 minutes of hand walking.